CORE Hydration is ultra-purified and balanced with electrolytes and minerals to achieve your body’s “perfect pH” of 7.4. CORE Organic fruit infused beverages, USDA Certified Organic with only 5 calories per serving, they are also low glycemic (with less than 1g of sugar per serving), gluten-free, non-GMO, Kosher, soy-free, and vegan. A health and wellness company founded in 2015 on innovative design and science, CORE® Nutrition is the maker of CORE® Hydration premium bottled water and CORE® Organic fruit infused beverages. CORE Nutrition was founded by beverage industry veteran Lance Collins, best known for creating billion dollar brands such as FUZE® and NOS Energy®. CORE Hydration is a new premium bottled water that is perfectly balanced to work in harmony with your body’s natural pH. 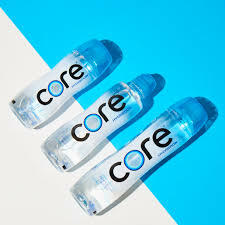 Through a unique process, CORE Hydration is ultra-purified and balanced with electrolytes and minerals to achieve your body’s “perfect pH” of 7.4. Available in 20 oz., 30 oz. and 44 oz. wide mouth closure PET and a 24 oz. sports-cap PET, as well as a 16.9 oz. six-pack, CORE’s revolutionary contoured bottle is 100% recyclable and BPA free. The company’s second product, CORE Organic fruit infused beverages, is delivering what consumers have been thirsting for but unable to find, an organic, low calorie and great tasting beverage. In addition to being USDA Certified Organic with only 5 calories per serving, they are also low glycemic (with less than 1g of sugar per serving), gluten-free, non-GMO, Kosher, soy-free, and vegan. Each serving of CORE Organic contains the same amount of antioxidants as a 1⁄2 cup serving of blackberries or cherries. CORE’s music brand ambassadors include Adam Levine, Becky G, Diplo, Juicy J, Karlie Kloss, Katy Perry, and Max Martin. CORE brands can be found at leading retailers such as 7-Eleven, Circle K, Wawa, Albertsons, Kroger, Safeway and Target. For more information and to find a retailer near you, visit www.core-hydration.com.